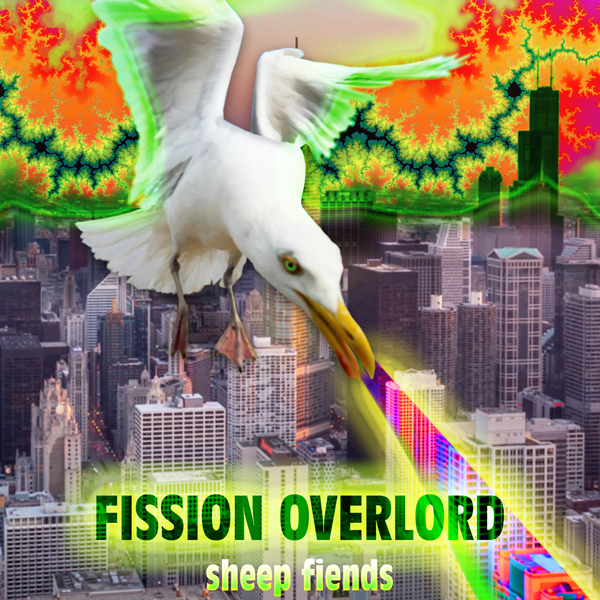 1: Fission Overlord (3:17) Rating: 5 Record date: 10/03/2009 DDD digital multitrack recording by Brian Cameron, Brian McNally, MX Skroch Copyright © 2009 The Sheep Fiends Foundation. 2: I Like My Chicken Fryin' Size (2:19) Rating: 4 Copyright: © Merle Travis Lyrics by: Merle Travis Record date: 10/03/2009 DDD digital multitrack recording by Brian Cameron, Brian McNally, MX Skroch Copyright © 2009 The Sheep Fiends Foundation. 3: Gettin' Inside My Head (6:55) Rating: 4 Lyrics by: MX Skroch Record date: 10/03/2009 DDD digital multitrack recording by Brian Cameron, Brian McNally, MX Skroch Copyright © 2009 The Sheep Fiends Foundation. 4: Dread Reaper (2:55) Rating: 3 Record date: 10/03/2009 DDD digital multitrack recording by Brian Cameron, Brian McNally, MX Skroch Copyright © 2009 The Sheep Fiends Foundation. 5: Citadel (2:08) Rating: 3 Record date: 10/03/2009 DDD digital multitrack recording by Brian Cameron, Brian McNally, MX Skroch Copyright © 2009 The Sheep Fiends Foundation. 6: Different Set Of Rules (5:31) Rating: 4 Lyrics by: Brian Cameron, Brian McNally, MX Skroch Record date: 10/03/2009 DDD digital multitrack recording by Brian Cameron, Brian McNally, MX Skroch Copyright © 2009 The Sheep Fiends Foundation. 7: Looking So Tight (8:09) Rating: 4 Lyrics by: Matthew Cramer Record date: 10/03/2009 DDD digital multitrack recording by Brian Cameron, Brian McNally, MX Skroch Copyright © 2009 The Sheep Fiends Foundation. 8: Nevermind Now (4:25) Rating: 3 Lyrics by: MX Skroch Record date: 10/03/2009 DDD digital multitrack recording by Brian Cameron, Brian McNally, MX Skroch Copyright © 2009 The Sheep Fiends Foundation. 9: Innerlude (1:55) Rating: 3 Record date: 10/03/2009 DDD digital multitrack recording by Brian Cameron, Brian McNally, MX Skroch Copyright © 2009 The Sheep Fiends Foundation. 10: The Sea Gull (7:36) Rating: 4 Record date: 10/03/2009 DDD digital multitrack recording by Brian Cameron, Brian McNally, MX Skroch Copyright © 2009 The Sheep Fiends Foundation. 12: Ballpark (1:52) Rating: 2 Lyrics by: Matthew Cramer Record date: 10/03/2009 DDD digital multitrack recording by Brian Cameron, Brian McNally, MX Skroch Copyright © 2009 The Sheep Fiends Foundation. 13: Bad Shoes (3:54) Rating: 3 Record date: 10/03/2009 DDD digital multitrack recording by Brian Cameron, Brian McNally, MX Skroch Copyright © 2009 The Sheep Fiends Foundation. 14: White Lightning (4:07) Rating: 4 Copyright: © George Jones Lyrics by: George Jones Record date: 10/03/2009 DDD digital multitrack recording by Brian Cameron, Brian McNally, MX Skroch Copyright © 2009 The Sheep Fiends Foundation. 15: Here Comes My Baby (2:16) Rating: 5 Copyright: © Cat Stevens Lyrics by: Cat Stevens Record date: 07/31/2009 Also appears on: Covers DDD digital multitrack recording by Brian Cameron, Brian McNally, MX Skroch Copyright © 2009 The Sheep Fiends Foundation.